Communicare Training and Development is the leading company that provides customized, applicable and fun communication trainings. 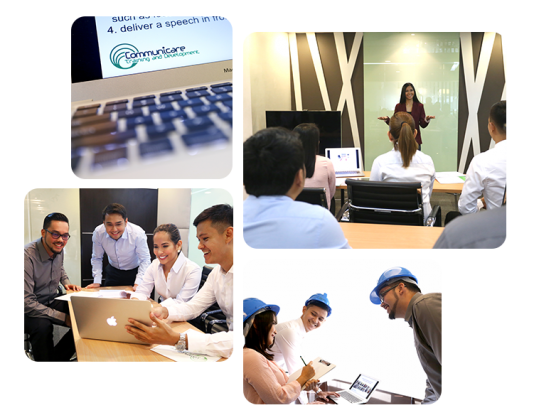 Communicare Training and Development’s goal is to help organizations and individuals in the Philippines learn how to communicate effectively. We offer customized, applicable and fun communication trainings. We customize our trainings to address the training needs of our participants. Before conducting a training, we conduct a training needs analysis through questionnaires, meetings and/or a review of documents such as the participants’ past business correspondences. This allows us to design a training that is suitable to the needs of our participants and their organization’s line of business. Our trainings are applicable. Discussions are related to real-life scenarios and the business and line of work of our participants. Moreover, during the training, participants are given hands-on activities that are typically done daily in the workplace such as writing, speaking and presenting. Lastly, who said that learning can’t be fun? We believe that a fun learning atmosphere is far more enriching! We ourselves are not fans of long, boring lectures. Thus, our trainings are very interactive. Aside from the class discussions, our participants learn through hands-on activities and interaction with their facilitators and co-participants.